"It is a rare opportunity to have people from different backgroundS collaborating together." The Just City Index has been developed over the last five years as a result of research and crowdsourced input on the values communities desire in their cities and neighborhoods to combat conditions of injustice. Many wellbeing frameworks prescribe a limited set of values or principles to define a community as resilient, sustainable, livable or happy. But each city and neighborhood has a unique set of qualities, conditions and inhabitants — which means they require different measures of wellbeing. The Just City Index is a framework of 50 values, to be used as a tool for communities to establish their own definition and principles for what make each city or neighborhood more just. To define your Just City, explore the Index and our set of engagement tools. Thank you, your download will begin shortly. 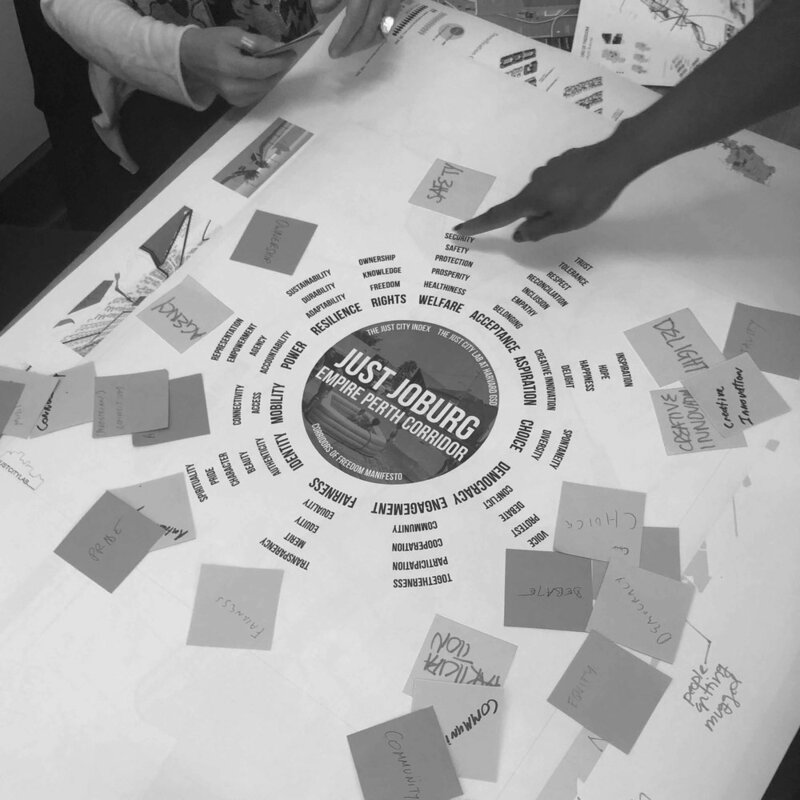 In our workshops and masterclasses, we use a range of tools to guide participants through the Design for the Just City process. Download our tools and tutorials below to start doing it yourself. Your group will reflect on conditions of justice and injustice in their cities, align on the Just City values most important to their sites, and generate value-driven design responses to conditions of injustice. How does justice or injustice show up in the place where you live or grew up? How can your values align with others' to create a shared community vision? What innovative ideas can we develop to realize our values and combat injustice? A Just City Lab masterclass is a custom-designed and immersive multi-day training experience with hands-on discussion, workshops and lectures. We've engaged with collaborators around the world to develop 2-3 hour workshops for a range of contexts, durations, and group sizes. 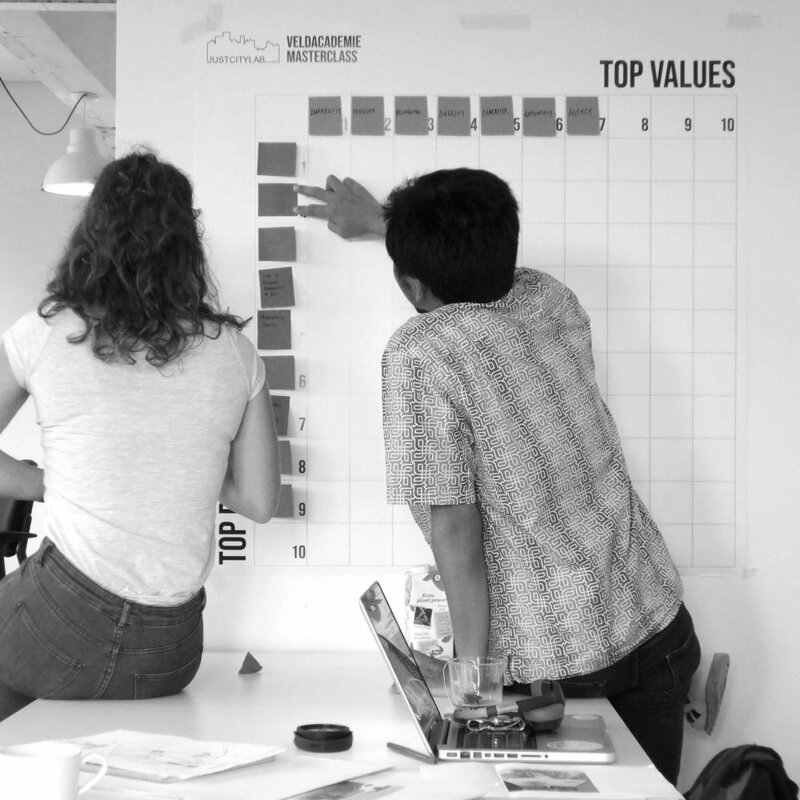 Throughout the process and in small table groups, participants are asked to reflect on their own experience of values in the cities they call home, to negotiate values critical to addressing injustices with their value clustering posters, and to generate design possibilities to take forward.